Cats are so much more different compared to dogs, especially when they come with that kind of stand-offish look and devil may care attitude. You are there to serve them, and not the other way around, and they come and go as they please. Still, there are some basic instincts in a cat that can never be done away with, and that would be the need to scratch. 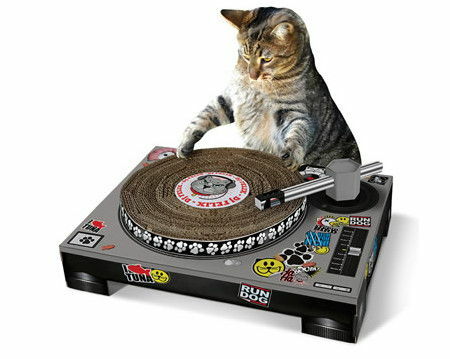 Why not let your feline friend release its frustrations with the $29.95 Cool Cat’s DJ Scratch Pad? The Cool Cat’s DJ Scratch Pad is a scratch pad for cats that looks like a hip-hop DJ’s turntable. It comes festooned with an assortment of themed stickers which will definitely make any self proclaimed DJ proud, where the turntable’s platter is capable of spinning in either direction whenever a cat paws at its layered cardboard top to sharpen its claws. Heck, it even comes with a posable tone arm for added effect.